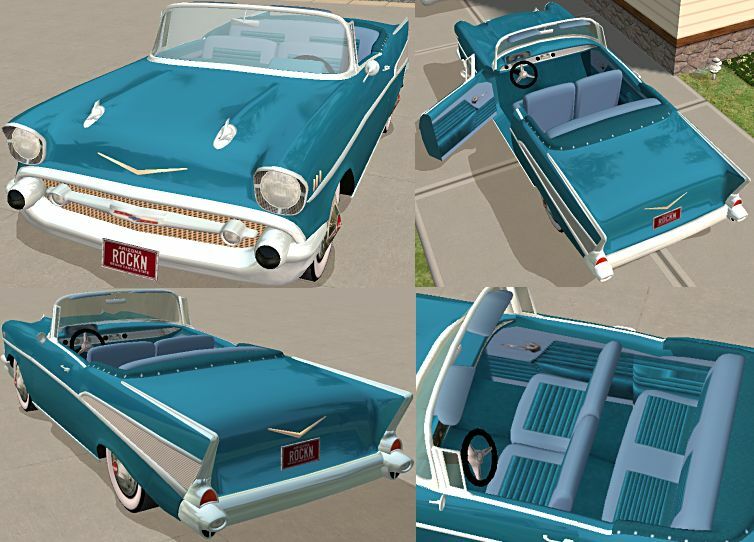 This is a drivable vehicle, it REQUIRES the NightLife expansion pack. Sims can still WooHoo and Makeout, but there will be no animation - they will just fade out, make some noises, and fade back in. Included in the download is the Mesh plus all the exterior and interior color options shown. 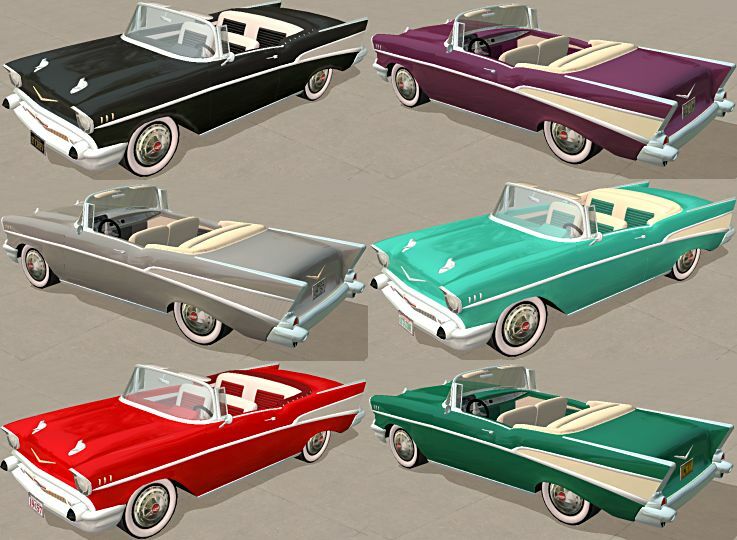 The 1957 Chevy came in three trim options - the Bel Aire, the 210, and the 110, but a convertible came only with the Bel Aire or the 210 trim. The difference was that the Bel Aire had a gold colored grille mesh and v emblems, plus a ribbed stainless steel panel on the rear fenders. I have included both Bel Aire and 210 color options. The main .package file was modified from the Maxis sportscar using the .Ms3dASCII export/import of SimPE. The body mesh was modified from a free mesh found on 3d Cafe, the steering wheel from the Maxis Hunka mesh, wheels and tires from the Maxis Sedan, and some scratch built parts. The UV_mapping was done from scratch, using MilkShape's UV Mapping tools. You can use and alter my alphas, textures, and bumpmaps as you wish - no credit needed. Please put some effort into it, there are many good tutorials that will show you how to make something you can be proud of. If you are posting your work on ModTheSims2, link to this thread so people can get the mesh. If you are posting on the Exchange, you should also link to this thread since meshes do not always package up properly in Lots. If you are posting them on your own site you can offer the mesh for download on your site too. Credit for the mesh is appreciated but not required. If you are altering the mesh for any reason, please take the trouble to do it correctly - change the filename, use fix integrety, and re-link it to your own color .packages. You can use all my items in your lots, screenshots, stories, movies, and complete Sims - no credits necessary, just have fun with them. To make this perfectly clear, what I am saying is that you can do whatever you want with my items, and post them anywhere you like. That includes free sites, the Exchange, paysites, and donator-only areas. I just ask that you take the trouble to do it correctly so your stuff doesn't interfere with anyone else's.